The rail company is providing dedicated carriages for football fans and deploying staff trained in conflict resolution to deal with the supporters at stations. 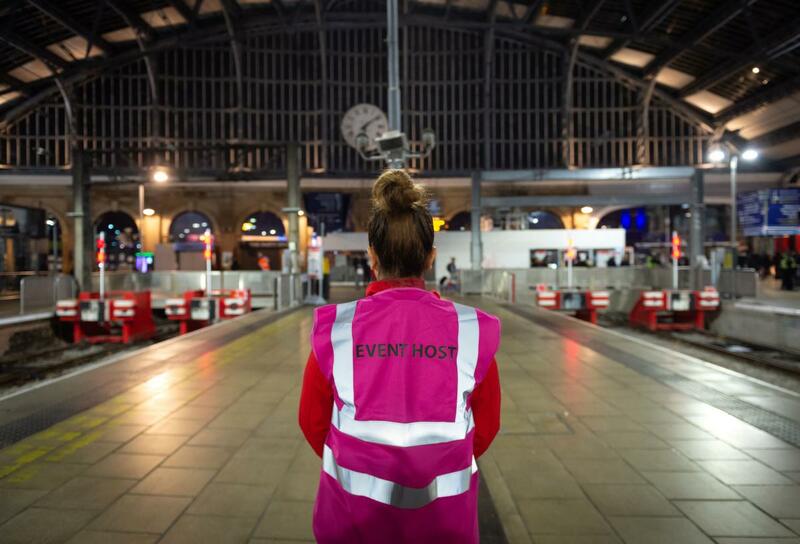 Virgin Trains said its event hosts are wearing pink high visibility vests because the colour "is known to have a calming effect on crowds". The initiative is designed to improve the experience of fans travelling to and from matches, as well as help other passengers using trains at the same time. Event hosts have been told to have a "zero-tolerance policy" towards aggressive behaviour and to contact British Transport Police (BTP) immediately when such incidents arise. Staff have received extra training in customer service and conflict resolution techniques, such as maintaining eye contact, not interrupting people when listening to them and avoiding being judgmental in situations that could escalate. The initiative was fully launched at the beginning of the current season. Supporters travelling to matches affect 42 weekends of the year for Virgin Trains, with fans from an average of four Premier League teams using its services every Saturday. The operator's event coordination manager Gary Steele said: "Providing a better environment and engaging with them and other customers on busy days will help remove any points of potential conflict, and offer everyone a better customer experience and a smooth, safe and enjoyable journey." Among the fans using Virgin Trains on Saturday are Arsenal supporters travelling to watch their side play Liverpool and Everton fans making the long trip to the south coast for their match with Brighton. Some 653 football-related incidents were recorded by BTP during the 2017-18 season, according to figures published by the force. - Liverpool fans sang racist chants on a platform. BTP's chief superintendent Allan Gregory described the use of specially trained rail staff as "an important step forward" in improving journeys for all passengers. He said: "We know that on match days trains can quickly become busy places and we want everyone travelling to have a safe journey. "These new event hosts are an interesting and creative new idea which we hope will help all passengers to have a better journey and hopefully a good day out too." Around 1,500 Manchester United supporters and 1,000 Liverpool fans travel on Virgin Trains services from the south of England to attend home games. The firm has taken a number of other measures to deal with spikes in demand caused by football matches, such as providing longer trains, creating dedicated carriages for supporters and offering bespoke catering packages. In addition, any customer booking online who is not travelling to a match is alerted via a pop up message that these services are likely to be busier than normal.